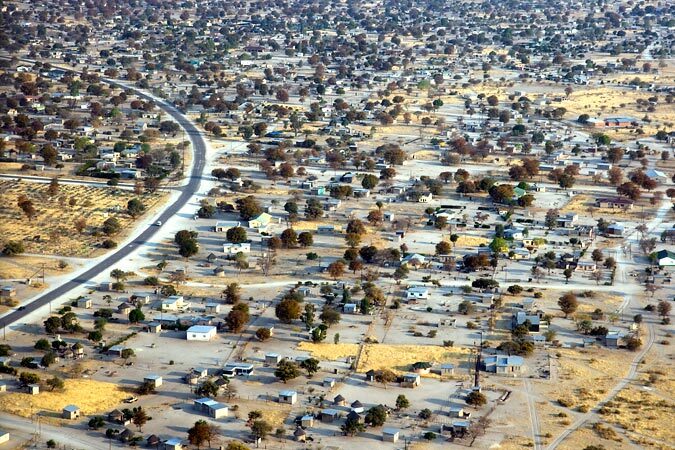 We arrived in Maun, a long, sparse strip road of small, square brick shops, with more buildings continuing on into the bushland beyond. We stopped at a local butcher to buy some steaks. The butcher was a shack without a door; inside was a glass display counter piled high with cow hearts, another pile of enormous cow tongues, and some assorted steaks. 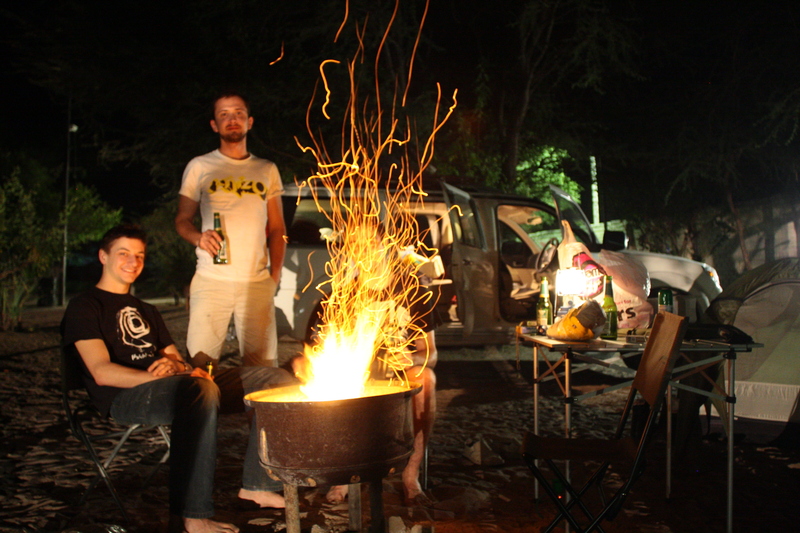 That night we stayed at the Crocodile Camp, a campsite on the banks of the Okavango Delta. This was the big attraction of the region, thousands of square kilometers of wetlands, supporting many plant and animal species. We’d get out there tomorrow, after a good night’s rest. It was dark when we arrived and got out of the car, and the air had become quite cold. We were aching from an 8-hour drive. The campsite was on a hill leading down to the river, criss-crossed with small pathways, with a reception and a bar down by the water. We set up our tents in the dark, admist a swarm of ravenous mosquitos. Thankfully we knew the tent setup routine well. 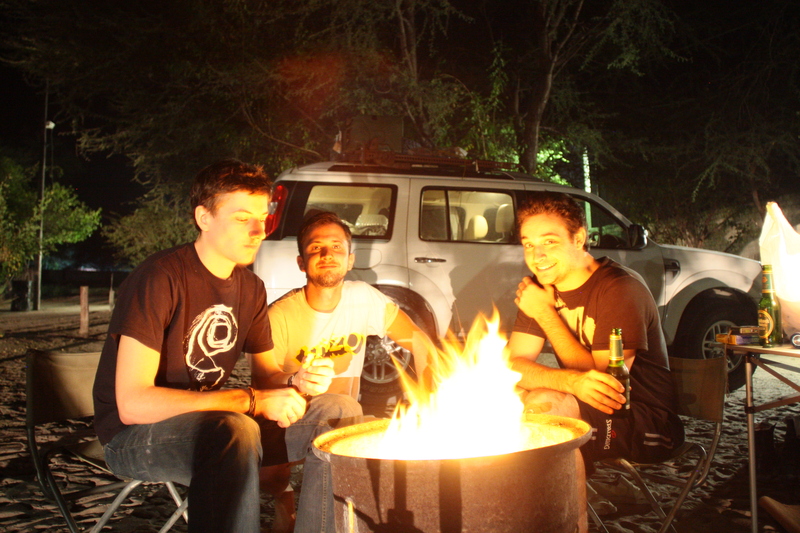 We made a fire in a barrel and got to work braaing the steaks (the South African style of barbecuing, holding the meat in a clamp-style grill). 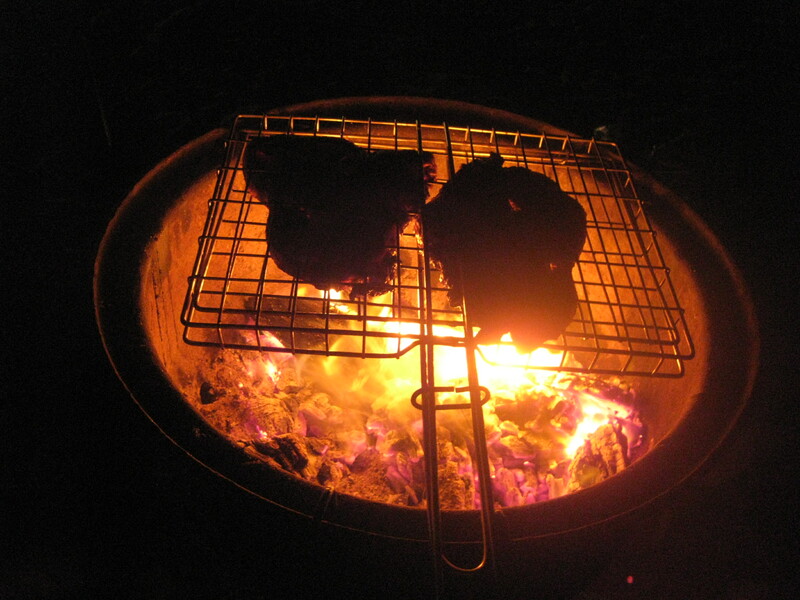 We covered them in tremendous amounts of salt and pepper, and ate them after about 20 minutes on the fire; they were well done to say the least. We decided to head down to the bar, a pretty wooden shack with no walls, wooden floors and a grass roof. It was adjacent to a small swimming pool, and the other side overlooked the wetlands which was alive with a symphony of bleating frogs. A group of rowdy South Africans in their early forties were enjoying some drinks. We turned up in our towels, intending to swim in the pool, which attracted the attention of the group. The air was cold and the water was freezing, and with snickers, they couldn’t believe we were brave enough to try. As we finished our first round of beers, one of the South Africans approached us with a proposition. If we jumped in the pool (all three of us, simultaneously), they would buy us a round of ‘go-go juices’, a cocktail of their choosing. It seemed like they were making fun of us, but we eventually agreed. We jumped in the pool – and instantly regretted it. Dripping and freezing and shaking with possible hypothermia, we crawled desperately out of the pool as if we’d just gone into a frozen lake. The South Africans, amid raucous laughter, kept their part of the deal and produced three go-go juices, a bright blue concoction in a tall, slender glass containing a shot of almost everything the bartender had to offer. Then we received our next challenge; bragging rights to first person who could finish their drink. The South Africans were clearly messing with us. The drink was so full of ice, it was numbing our hands. But we were having fun nevertheless. The challenge began, and within seconds the nerves in our brains were giving us torturous brain-freezes. We spluttered and groaned, our heads in pain, until I finally finished drinking, Wessel in a close second. “So…” I asked, struggling get my brain back to it’s normal temperature, “why is it called go-go juice?“. “Because you go-go straight to bed!“, the group chimed. We looked at each other, suddenly feeling very drunk and sick, and agreed. We said goodnight and went to bed.